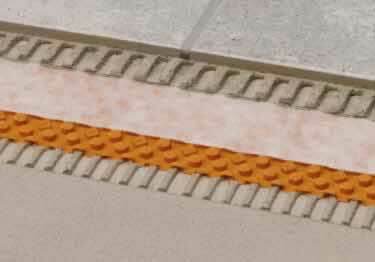 A drainage membrane engineered for exterior applications, for use within thin-bed ceramic and stone tile assemblies. Constructed with a studded polyethylene sheet with a laminated polypropylene filter fabric. DITRA-DRAIN delivers drainage and uncoupling benefits in a variety of exterior applications including: exterior floors, patios, walkways, and balconies. To seam the cut edges of the DITRA-DRAIN member use DITRA-DRAIN-STU, self-adhesive seaming tape. DITRA-DRAIN-STU allows for the filter fabric to continue at the top of the membrane and provides for ventilation and drainage.